Depending on various aspects, such as the material they’re made from, size, design, and brand, a buffet table can be quite pricey. It’s a fantastic addition to any house, both from an aesthetical and a practical point of view. But can you buy looks and quality at a reasonable price? As it turns out, you can. Here is our amazing list of 7 buffet tables on a budget you can head out to shop for now! This beautifully built wooden dining room buffet retails for approximately $799, and you can buy it from places such as Wayfair, Furniture Cart, Homeclick or Furniture Pick. It’s quite breathtaking in its classical simplicity, and it will make an excellent addition to any living room. As far as technical details go, it has a 35.5-inch height, 47.5-inch width, it’s 18 inches deep and it weighs 125 lbs. It’s brown it color, made from high-quality oak and comes in a distressed finish. It’s eco-friendlier than other consoles and has glass doors. 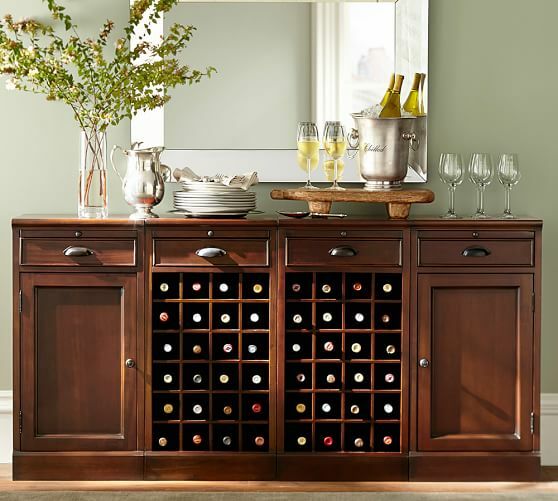 It has a set of cubbies that decorate both ends and which can hold up to ten bottles of wine. It also has two drawers in which you can keep all the dining room elements and decorations you need. It reminds one of a calm and peaceful country house. This buffet table, as its name suggests, is available for purchase at Pier 1, at the outstanding price of $600. Needless to say, it’s subtly charming, having an old European flair to it. It comes in creamy sage nuance, and it has a slim profile that will make it easy for you to fit it through your doors and hallways. It also has antiquated brass handles that complete the Old World vibe. Its inside has a felt lining, two simple drawers with dovetail construction and an adjustable interior shelf. It’s 42 inches wide, 18 inches deep, and 36 inches high. It’s made from plywood, engineered wood, and rubberwood and it will require you to assemble it. However, seeing how beautiful it is, you’ll probably find the task of putting it together a pleasant pass-time. Party favors, as well as dishes can be spread out on it for auto-serving, the menu or the china can also be displayed, it can be used as a desk, you can put a modern lamp on it, family pictures, contemporary art pieces as decoration or even your Christmas wreath. This buffet table has a distinctly masculine vibe to it. It’s raw and almost unpolished, being made of horizontal wooden boards, which are not painted. This is the reason why it would be perfect for a man cave, a minimalist dining room, a wine cellar or even a wooden cabin as far as decorating goes. It’s also very retro in style, seeing as it has a naturally-knotted woodgrain. You can place it against a pale colored wall or in a place with plenty of sunlight, where it can truly shine in its natural beauty. It weighs 112 pounds, it’s 8 inches high, 21 inches wide, and 58 inches long. Also, it’s perfect for storing wine or letting it decanter before a meal. Also, it retails for around $449. 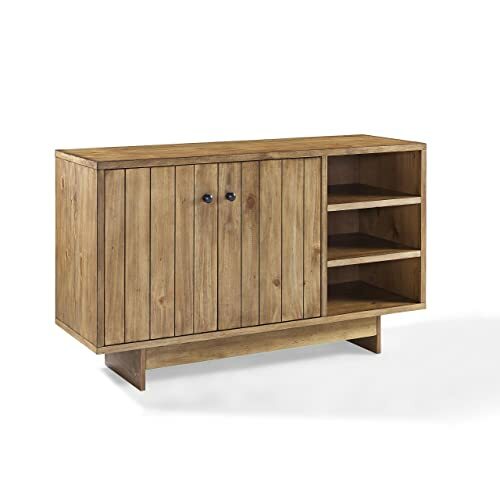 The Zarina is one of the cheapest pieces of furniture on our list, seeing as it retails for only $257. Its distinctive element that sets it apart from all other buffet tables is the slight curvature its legs take on their way to the floor. Also, this buffet cabinet has quite a lot of storage options. Its counter is long, it has an underneath open space to store plates and cups, a total of nine slots for wine bottles and two rectangular drawers on each side. The Zarina comes in a delicious dark espresso color and, considering its size and storage facilities, it’s truly a bargain for only a couple hundred dollars. 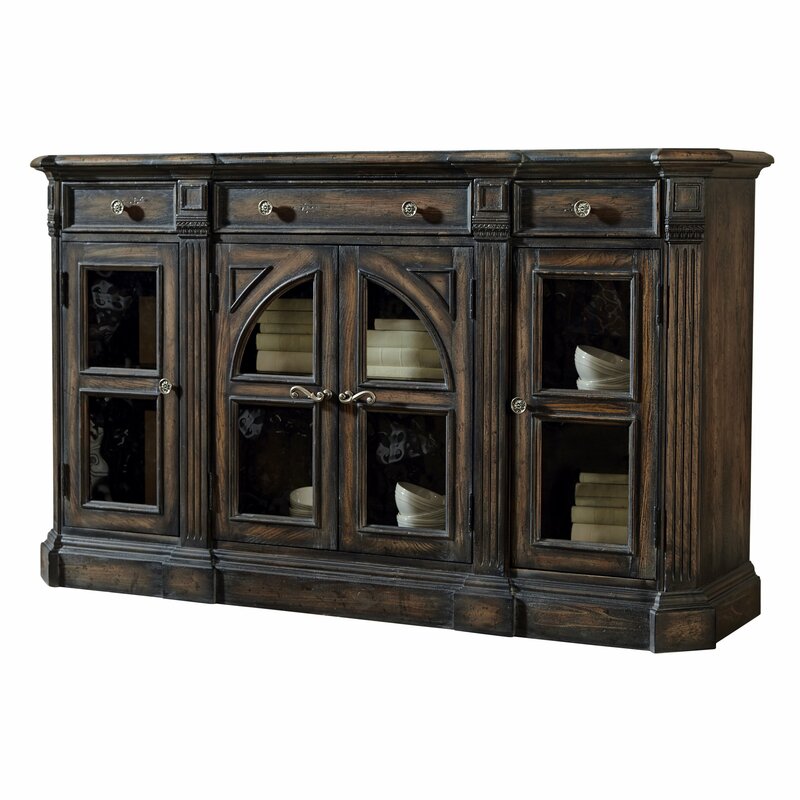 Granted, this bar sideboard is a bit pricier than all the other servers, coming to us at about $1177. However, once you take a look at it, you’ll probably decide you want it in your house as soon as possible. Right next to your hutches. The Modular Bar Buffet is so exquisite in both design and color that it actually looks like it belongs in a library, not necessarily in a living room holding plates and knives. It offers a whopping 24 slots for wine bottles, three drawers at the top and two double-decked cabinets on each side, protected by glass doors. It’s truly an elegant piece that you might even fit into your bedroom with a bit of imagination or any other rooms for that matter. There’s just something about distressed wood, especially when painted in pastel candy colors, such as this beautiful dusty blue. It has an almost exotic feel to it, given its lengthy and airy appearance and high legs. You can picture it surrounded by beautiful scarlet orchids in clay pots and against a dark green leaf-patterned wallpaper. However, given its freshness and versatility in setting, you can place it in your sunroom, living room or even kitchen for a bit of inspiration with your cooking. Pair it with a beautiful kitchen hutch and you’re ready to go. It has round brass knobs and completely covered cabinets and drawers. Also, it retails for the excellent price of $399. The Accentrics might, indeed, be a bit over the budget, but not by much. It’s available for purchase for $2500, and it’s worth every single penny. It will command the entire room where you decide to put it in, all the other pieces of furniture bowing to it in awe. It’s dark and sophisticated, and it’s worn out appearance makes it look like you, maybe, salvaged it from a noble family’s mansion. It has very ample storage space, presenting three drawers on top, the big one in the middle and the smaller ones on each side and three double decked cabinets on the bottom. They are all closed by glass doors, the large central cabinet benefiting from double doors with a fantastic gothic accent. It also has classic columns carved into the wood, which truly makes it look like it’s lording over the house. As far as cheap prices go, remember you can also find all these pieces on sale at times, especially with large retailers. You can also use coupons to buy them, or get a discount on the side that will lower the price even more. Black or white buffet tables are usually the cheapest, even without a coupon. Rest assured that there is a perfect buffet table out there for every single style and personal preference. All you have to do is look for it. We’ve helped you out in this respect, by presenting to you 7 outstanding ideas and pieces, all budget-friendly. All you have to do now is head out shopping!